Winning Senior Teams have the opportunity to represent Alabama at the National WHEP Contest each year. The Contest moves around to different states every year. 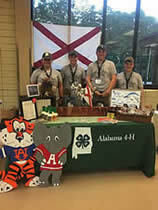 In 2015, Alabama hosted the National WHEP Contest at the Alabama 4-H Center in Columbiana. We welcomed 14-states and were able to showcase the diversity of natural resources that our state boasts. Participants received a guided tour that featured stops at a longleaf pine management stand and a TREASURE Forest certified site. The event was a huge success and we feel certain that our visitors experienced ‘Southern Hospitality’ at its best.